This document presents a brief tutorial for the Grid Analysis and Display System (GrADS). The following sample session will give you a feeling for how to use the basic capabilities of GrADS. This sample session takes about 30 minutes to run through. This example data set is a a binary data file containing sample model output (model.dat) and data descriptor file (model.ctl), a text file that contains the necessary metadata that GrADS needs. The data descriptor file describes the structure of the data file, which in the case contains 5 days of global grids that are 72 x 46 elements in size. The text of the sample session below is also included for your convenience. GrADS will prompt you with a landscape vs. portrait question; just press enter. At this point a graphics output window should open on your console. You may wish to move or resiae this window. Keep in mind that you will be entering GrADS commands from the window where you first started GrADS -- this window will need to be made the 'active' window and you will not want to entirely cover that window with the graphics output window. In the text window (where you started grads from), you should now see a prompt: ga-> You will enter GrADS commands at this prompt and see the results displayed in the graphics output window. d is short for display. You will note that by default, GrADS will display a lat/lon plot at the first time and at the lowest level in the data set. GrADS will not draw anything to the display window, but instead prints out "Result value = 5447.17" to the command window. In the above sequence of commands, we have set all four GrADS dimensions to a single value. When we set a dimension to a single value, we say that dimension is "fixed". Since all the dimensions are fixed, when we display a variable we get a single value, in this case the value of 'hgt' at the location 90W, 40N, 500mb, at the 1st time in the data set. We have set the X dimension, or longitude, to vary. We have done this by entering two values on the set command. We now have one varying dimension (the other dimensions are still fixed), and when we display a variable we get a line graph, in this case a graph of 500mb Heights at 40N. In this case we have set the Y (latitude) and Z (level) dimensions to vary, so we get a vertical cross section. We have also displayed two variables, which simply overlay each other. You may display as many items as you desire overlaid before you enter the clear command. Here we have calculated precipitable water in mm. 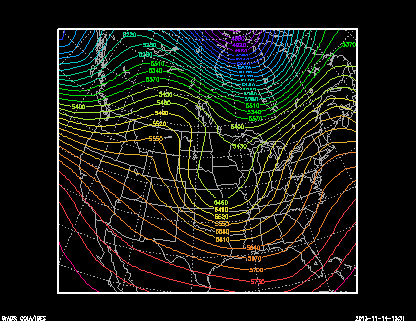 Here the U component is the wind speed; the V component is moisture. In this case, we have told grads to access and operate on data from longitude 145W to 40W, and latitude 15N to 80N. But we have told it to display a polar stereographic plot that contains the region bounded by 120W to 75W and 25N to 65N. The extra plotting area is clipped by the map projection routine. This concludes the sample session. At this point, you may wish to examine the data set further, or you may want to go through the GrADS documentation and try out the other options described there.